How Much Would it Cost to Build These Landmarks Today? 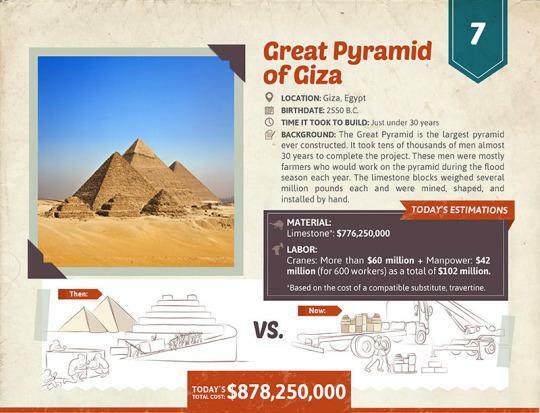 It took the Egyptians almost 30 years and tens of thousands of workers to build the Great Pyramid of Giza — but how much would it take to create it today? 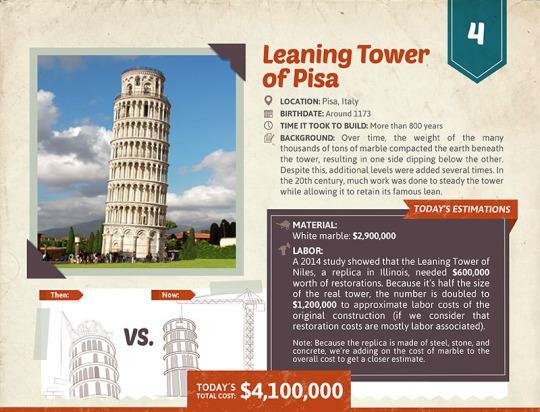 HomeAdvisor, a home improvement website, calculated the modern-day cost of building seven of the world’s most famous structures — including the Eiffel Tower, the Colosseum, and the Leaning tower of Pisa. 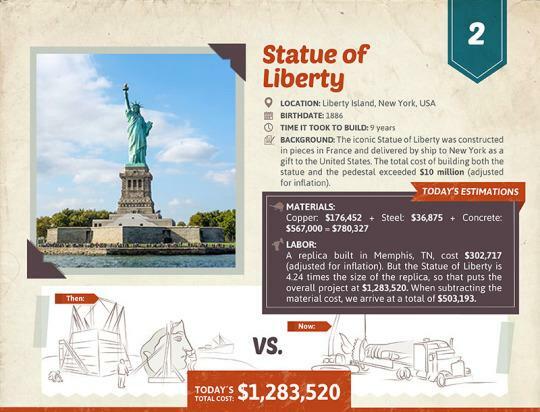 The site computed the estimates by taking today’s prices for the materials and labor originally used to build each landmark, and adjusted the figures for inflation. The result? 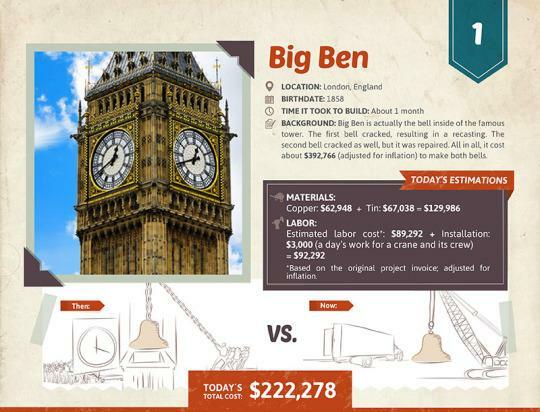 Construction projects ranging from about $222,000 for Big Ben to $878 million for the Great Pyramid. 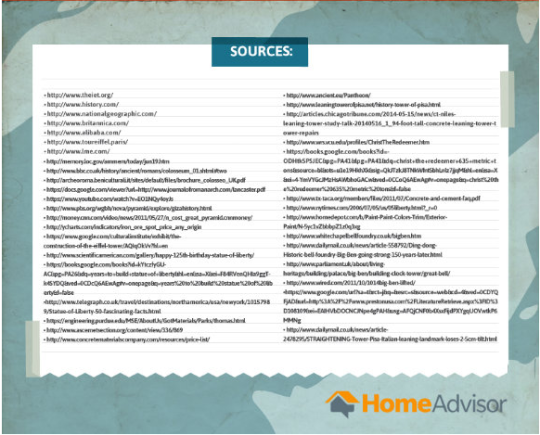 At first glance, those are huge numbers; but let’s put things into perspective. For the price of Big Ben, you could buy a small house in New Bern, N.C. Building the Statue of Liberty would cost about 3,000 times less than building One World Trade Center, New York City’s tallest building, which cost $3.8 billion to build, according to the Wall Street Journal. 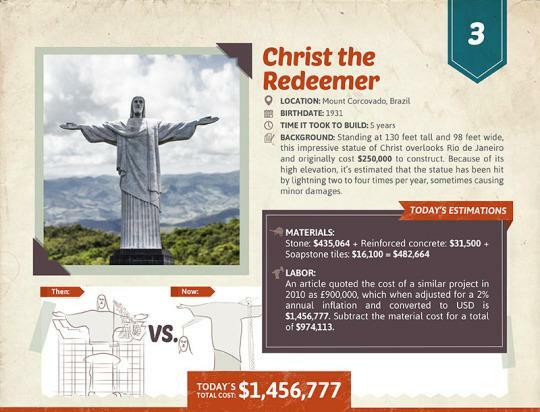 And it’s amazing to think that it would’ve been much cheaper for Brazil to create another Christ the Redeemer statue (only $1.5 million) than to build one World Cup stadium. Related: What Were They Thinking? 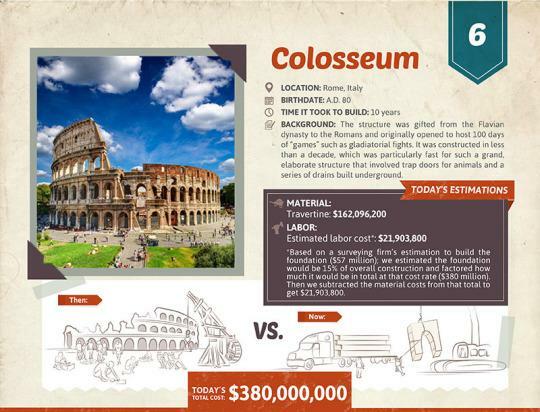 Tourists Arrested for Defacing Rome’s ColosseumScroll through the infographics to see all the monumental price tags. 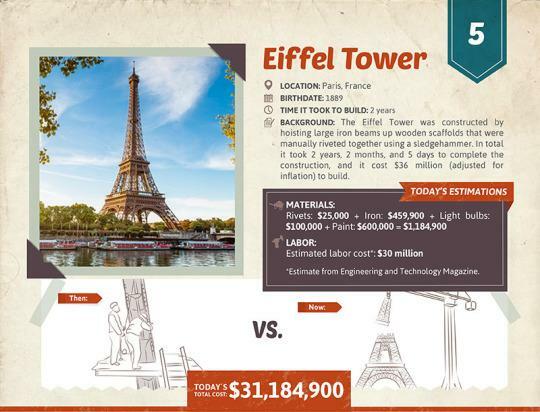 HomeAdvisor, a home improvement website, calculated the modern-day cost of building seven of the world's most famous structures — including the Eiffel Tower, the Colosseum, and the Leaning tower of Pisa. 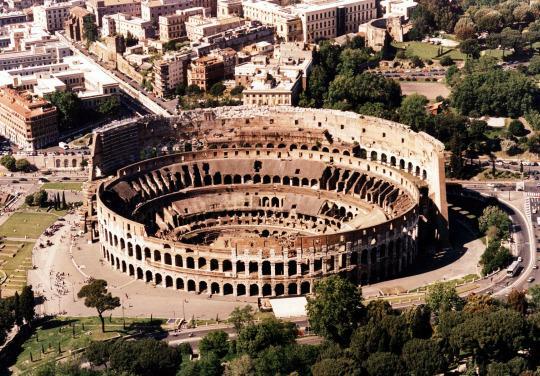 It would take $380 million in today's dollars to recreate the Colosseum's grand design.